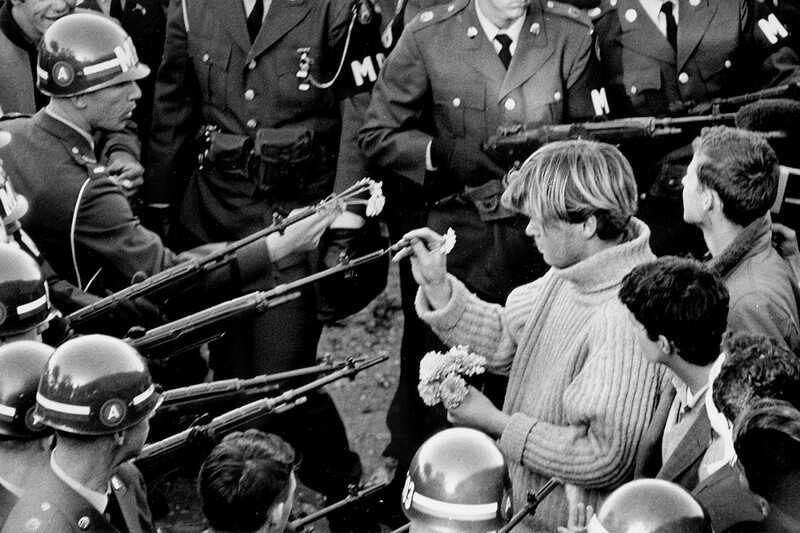 One of the iconic images of the 1960s. I was born in 1950 and “came of age” in the 1960s. Because of the time of my birth and raising, I am tempted by the conceit that my experience was somehow unique and extraordinary. This conceit derives in part because extraordinary things were happening around me as I was growing up — unprecedented, historic events, some of them in which I was a direct, active participant. Not the least of them were three massive crowds of a half-million people and one television audience of half-a-billion viewers in July 1969. During that period — starting in the spring of 1969 and through the summer of 1970, I kept a journal of sorts. Deep in the recesses of my unconscious , I harbored vague aspirations that one day I would be “some kind of writer,” though deep-seated reservations — unconsciously implanted by a skeptical family-of-origin about such a course — obscured my path. Nevertheless, I kept a journal. As I finished high school, lazed through most of the following summer and prepared to head off to college, I scribbled notes and stories into the loose-leafed pages of several three-ringed binders. Thinking that this was all material for work I would someday do, I actually made copies of dozens of letters I wrote, three-hole punched those pages and saved them as well. And then I put those notebooks in a box, and through four decades, after several moves back and forth across the continent and the Pacific Ocean (I lived in Hawaii in the 1980s) — through several lifetimes, realIy — I hung on to those journals. Forty-five years later I opened them again. 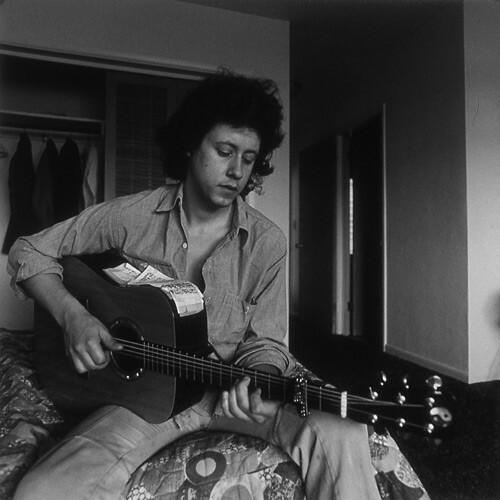 I have Arlo Guthrie to thank for opening the Time Capsule I left for myself more than four decades ago. Arlo’s classic recording of “Alice’s Restaurant” had been a big part of my igh school years. Inevitably, and often quickly, the station would get the needed pledges, and “Alice” would be aired again. One of those times when it was rebroadcast, I was ready with my own little Panasonic reel-to-reel tape recorder, and I made my own copy. For some reason I played that recording over and over until I knew the whole story by heart. Then I figured out the chord progression and started playing it on my guitar. Eventually I wound up playing it for Youth Group gatherings. Since most of the people I was playing it for had never heard it, my renderings of “Alice” were a hit, and I had endless fun playing it for anybody who wanted to sit through the whole thing. Fast forward to 2015, and Arlo had embarked on the “Alice’s Restaurant 50th Anniversary tour. I got tickets for his appearance at the City Winery in Nashville. And that got me to wondering if I still had that recording of “Alice” that I’d pirated off the air back in 1966. That’s when went into the basement. The next thing I know, I’m staring into a huge Rubbermaid tub filled with artifacts from the 1960s that I had store away since high school. 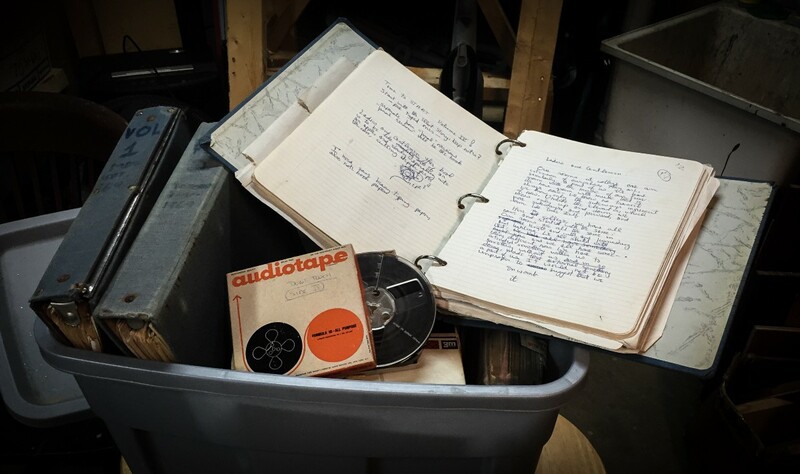 Among the relics were those three vintage, three-hole, loose-leaf binders –the journals I started in the spring of 1969 and kept pretty much for most of the following year; a rambling, scribbled documentation from the end of my adolescence. Much of what I found in those journals surprised me (and much of it horrified me). I found detailed accounts of several turning points along the twisting road from adolescence to some faltering semblance of adulthood. Mostly what I found among those faded, scribbled, hard-to-read-pages was a lonely young man trying to find his place in the crowds. I made a lot of notes about that. That isolation probably started when my father died. In 1957. When he was 37 years old, and I was all of 7. He’d been hospitalized with multiple myeloma — a form of cancer that consumes the bone marrow — for several months, but none of his three children knew the extent of his illness. Not until one morning when my mother came into the bedroom I shared with my brother and told us “your daddy died…” Of course being all of 7 years old I might not have had a real clue what that meant, but I do remember that for sometime after, I had dreams were Daddy walked into the house, through the back door into the kitchen, just like he always had after work. I’ll come back to that when we get to Apollo. Now that I have opened the Time Capsule, I’m compelled to finish the work that — according to these journals — I started almost half-a-century ago. As I do, I find myself motivated by a sense of urgency, born of the gift of being a sixty-something and looking back at my personal experience of the 60s. Please believe me when I call this undertaking a “gift,” because there are plenty of people my age who are no longer living. My own older brother, for example, who you will also meet in these pages. For starters, it’s hard to underestimate the role that self-medication may have had on the early years of my supposed adulthood. From the vantage point of nearly 50 years later, a pattern of self-therapeutic consistency emerges: On some level — particularly after the death of my father — I felt invisible my entire life, which is to say, there was an essential “me” that nobody quite recognized — least of all myself. Once the drugs kicked in, I got strangely comfortable with that invisibility. Stoned, I had the ability disappear into myself; After smoking a joint I had a secret soaking in my head. Inhaling pot was like hiding in the cloak of my own invisibility. Something else I see now between the lines in these journals was a fervent desire to be defined by ‘who I am’ rather than by ‘what I do.’ I think that’s why it has been so hard for me in the six-and-a-half decades that I have roamed this planet to settle on a single profession — because I didn’t want to be defined by what I did. So I have done lots of things. What I see in these pages now is an unformed soul whose true aspiration was to find some sense of himself as “an artist.” But I never believed that option was available to me — not after discovering in the first grade that I can’t draw. I somehow was persuaded that art was drawing, painting, making, well, “art.” Nobody ever told me otherwise. Oh, I also learned in the first grade that live performance was a form of punishment. I dunno, I might get to that, too. Apart from my own sense of isolation and uncertain purpose, the other astonishing thing that I am finding expressed in those binders is a personal manifestation of the ethos of the 60s — a fervent desire for the world world of violence, poverty, discrimination and injustice to change. Amid these barely-legible pages, I’m seeing an almost desperate attempt to recast the idealism of youth with some degree of inevitability — a desire to believe that the world was going to change because it had to. And that somehow a shifting landscape of technology and media would be the vehicle that drove that inevitability. 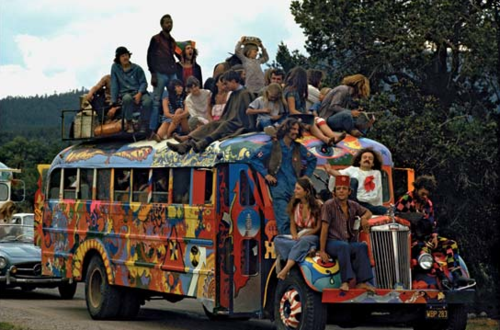 Looking at my experience in the 60's through the prism of the early 21st century (and 28+ years of sobriety), it seems at times that while the world has changed, it hasn’t changed nearly as much or as quickly as my generation wanted — expected it to. Once the magic and upheaval of the 60's had faded, there were careers to launch and families to raise, mortgages and car payments — all the trappings of the privileged life we expected to continue regardless of our youthful ideals. The world has certainly changed as our waistlines have expanded, our hair has fallen out, our faces have wrinkled, our chins have doubled and Medicare cards start showing up in the mail (along with the countless flyers and phone calls from Medicare supplement providers). But it is hard at times to tell whether the world has gotten better or worse, despite the best intentions of an entire generation. It’s difficult not to be cynical. 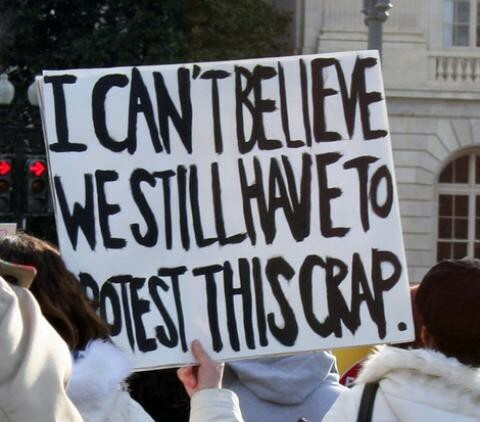 Maybe the world has changed. Or maybe it hasn’t. Maybe this is just how it has always been and always will be. And yet hope springs eternal. As I write in the winter of 2016, it appears a new generation of idealists has risen and congealed around the presidential candidacy of a septuagenarian baby boomer. And this nascent movement is once again fueled by new technology and a rapidly evolving media environment. There is a sense that the world is transforming; if the medium is the message, then once again a new generation is looking for an opening for genuine peace and justice. This is what that was like, if not for my entire generation, then for just me. What I found in those journals is the detritus of one person’s experience of an extraordinary time. I found reflections on the experience of one individual whose days were cast about not only by events of the era, but by his own very unconventional desires and furtive attempts to figure out what he wanted for his own life that made any sense in the face of two decades of other peoples’ expectations. Reading my notes from those long ago days and nights, I can see my own experience as that of a solitary passenger on a ship being buffeted by stormy seas. By distilling those journals, I hope to shed some light on the port where we all expected — or at least hoped — that the ship was going to land. But first let’s see where the voyage began….